We are back racing in Hungary. Seems such a short while ago that Kimi was blazing around the track in the F60 houndmobile, doing things with it that it shouldnt be able to do. It was a warm welcome for Felipe Massa as well since his accident here last year. When asked about it, he said he had so much else on his mind that he didnt even spare it a thought. I hope that is true. Since Ferrari had started getting their car up to speed they have slotted in behind the Red Bulls while McLaren who were previously chasing the Bulls have dropped back. This having to do with difficulties in getting their blown diffuser to work. As well as cracking the nut of the flexi-front wings now being used by Ferrari and Red Bull. It is a mystery to them and one can understand that looking at pictures comparing them. They actually flex so much that they are grazing the ground when in motion. That gives extra front grip which is sorely needed with the narrower front tires for this year. So it went as expected, Vettel and Webber and then Alonso and Massa. Followed by the single McLaren of Hamilton. 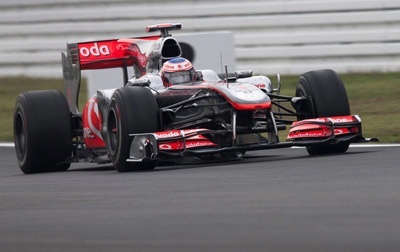 Button in the other McLaren in 11th was one of the sessions disappointments. As was Schumacher in 14th when you consider Rosberg qualifying 6th. Well – pole position hasnt benefited Sebastian Vettel a lot this season. There have been mistakes, bad starts, tech problems and more. But surely todays race would be different? 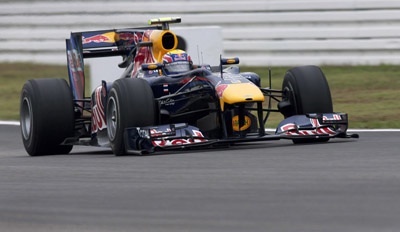 Especially since Red Bull claim to have found the reason for his bad starts: a clutch problem. The lights go out and by the looks of things they have indeed solved it! Vettel gets a great start and has the lead into turn 1. 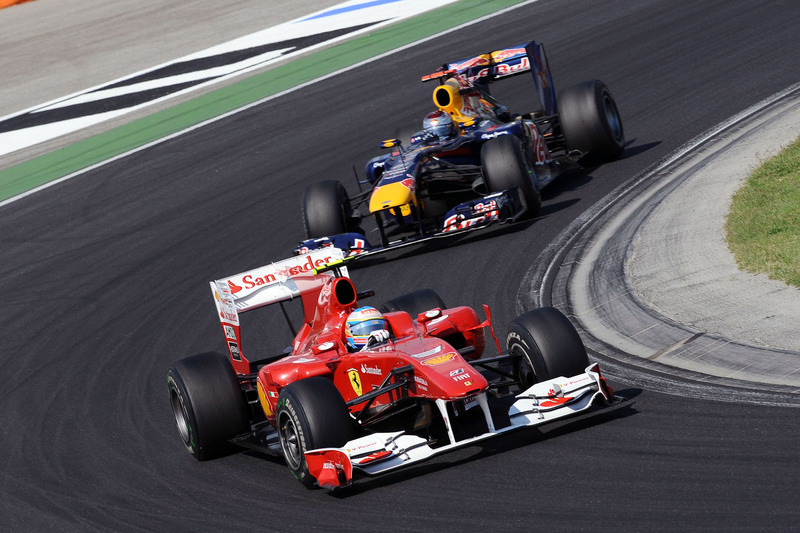 Closely followed by Alonso that got the jump on Webber who started from the dirty side of the grid. Massa is 4th and Petrov shows more brilliance by taking 5th position from starting 7th. Vettel starts pulling away and by pulling away, I mean crushing the opposition. He gains about a second on Alonso for each lap. Webber is faster than the Ferrari but passing is near impossible on the Hungaroring and can only stay close to Alonso and hope to pass him by strategy later on. As a big Kobayashi fan I also take notice that he has made it up to 15th from starting 23rd. 15 laps on and Vettel is pretty much gone so the excitement had to be found further down the grid. But that was until Liuzzi lost part of his frontwing on the track. Race control deems it necessary to deploy the safety car so the debris can be cleared. And from then on the race pops 3 amphetamine pills and goes into overdrive. The cars stream into the pits and we see a replay of Vettel getting the message at the very last second and jerks the car across the kerbs and dives into the pits. In hindsight it seemed it would have been better for him if he had missed it.. Inside the pits chaos ensues. We first see Renault letting Kubica go right into Sutils path and his race is ruined. Kubica picks up a drivethrough for that later on and his chances are gone as well. What may have caused the Renault lollipopman to lose his cool and make such a grave mistake might have been the bouncing wheel from Rosbergs car making its merry way through the pits! Bouncing 10 feet in the air and its a miracle no one were seriously injured. A Williams mechanic was hit but is apparently fine. 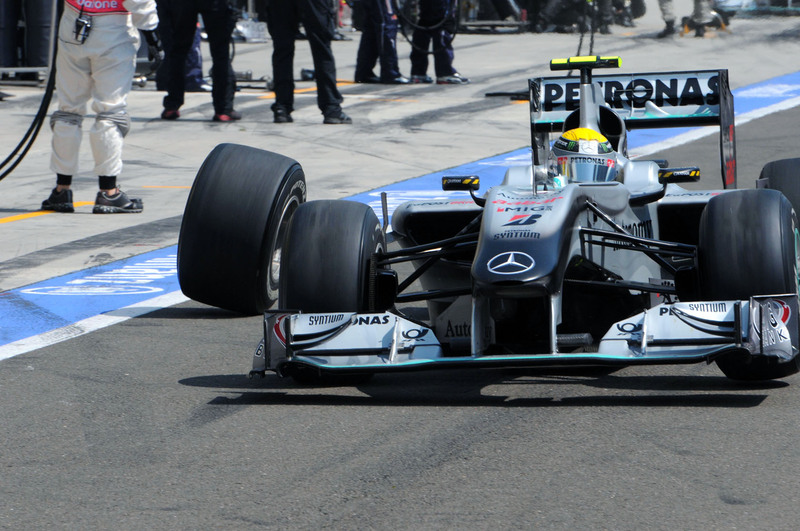 Hamilton has also managed to jump Massa for 4th position in the mayhem. Up at the front Webber is leading the race behind the safety car having opted not to pit. Surely a grave mistake it would seem. Safety car pulls in and Webber takes off. Vettel appears to be napping being far behind his teammate on the restart – or did he perhaps do it on purpose? Now it’s Webbers turn to pull out some amazing laptimes on the worn option tires. And it quickly dawns on what Red Bull is trying to accomplish: To build a gap big enough to jump Alonso for a Red Bull 1-2 finish. Vettel is not as fast on the prime tires but keeps enough contact to still be in front after Webber pits. On lap 25 however, we get news that Vettel is under investigation for dropping more than 10 car lengths behind Webber.. Can it really be – another pole position turning to another non-win for Vettel? Sure enough. Penalty given. Hello, drive-through. Vettel pulls into the pits to serve his time. And he doesnt do it in a stoic fashion. He lifts his hands and gesticulates angrily to – well, I dont know who. But someone. He does make it out in 3rd in front of Massa. Hamilton parked his car on the lap before so he was no longer a threat. A gearbox failure was to blame for his retirement. Up at the front Webber keeps setting fast times, he needs at least 18-19 seconds on Alonso to make it out in front after his pitstop. The Red Bull has some serious race pace and they are taking no chances and gets the gap up to about 23 seconds before he pits on lap 43. Trouble-free pitstop and he is out well in front of any competition. Nicely done. On lap 56 we get the last car in for his obligatory pitstop: Barrichello. He had been running in 5th and makes it out in 11th just behind his old pal, Schumacher. Williams may have taken a lesson from Saubers strategy in Valencia because Rubens is now on the soft options while Schumacher is on semi-worn primes. And he clearly has grip where Schumacher has none. And the Brazillian tries every trick in the book to pass his old teammate and its a great scrap to behold. Some say it was normal blocking but the FIA didnt. They gave Schumacher a 10 place grid penalty for the next race as a reward for his insane move. You can say it was pure racing but imagine if he had hit the wall at that speed, suddenly we could have a Williams upside down and landing face first on the fence to the right and then we have a dead Rubens. I dont wanna see that. On the slowdown lap we hear Vettel being calmed down on the team radio which was probably a wise thing to do because he was not a happy chappy. He pouts just as much on the podium like we saw Massa do in Germany. 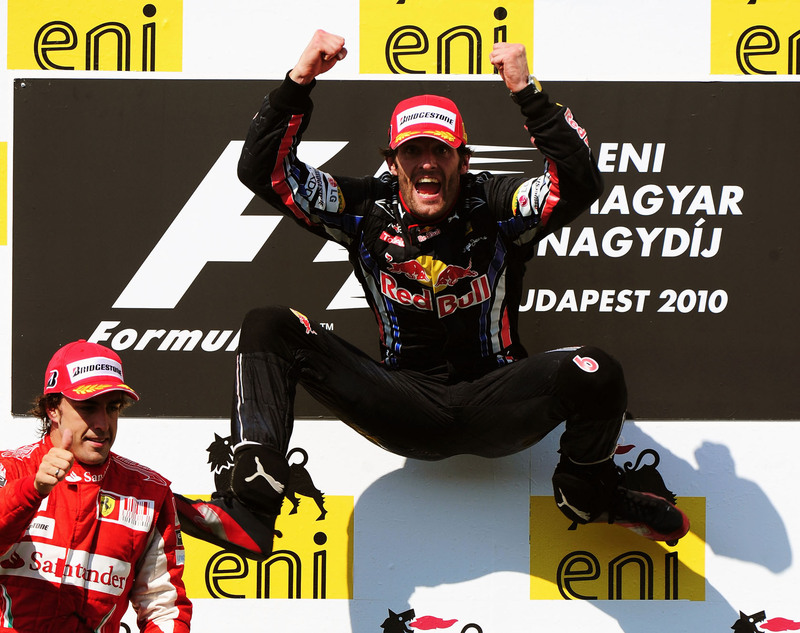 But Webber grabbed his chance and took the victory and so it was deserved. Vettel made a mistake that he wont make again. Thats for sure. Its Webber isnt it. It was Vettels race but his screw-up made the Australian seize the day with an impressive stint on the softs. He now leads the championship and can celebrate with some vegemite sandwiches downunder. 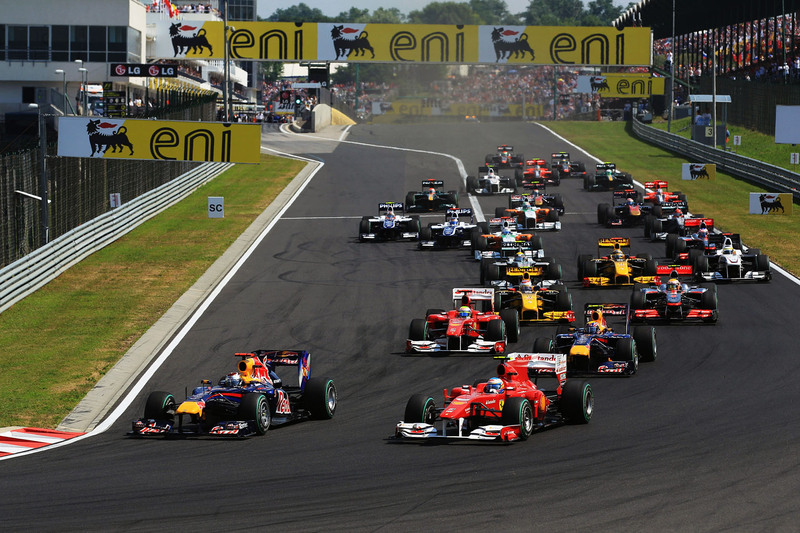 For a track that is usually known for unexciting races, the 2010 season manages once again to bring excitement and drama into where it was unexpected in the first place. I give it a 7 out of 10. Now we have a 4 week break until we head off to the greatest track in F1: Spa-Francorchamps. Kimi will be sorely missed. He could have won that race even in the Mercedes GP car if he had been there. And the scary part is that I actually believe that statement completely. Nevertheless, I am looking forward to it. Soren says: Errare humanum est, ignoscere divinum. Vettel finally had a good start and held on to his position and from there on I thought the race was pretty much over, with the kind of pace Red Bull had on that kind of circuit where overtaking was seemingly impossible. 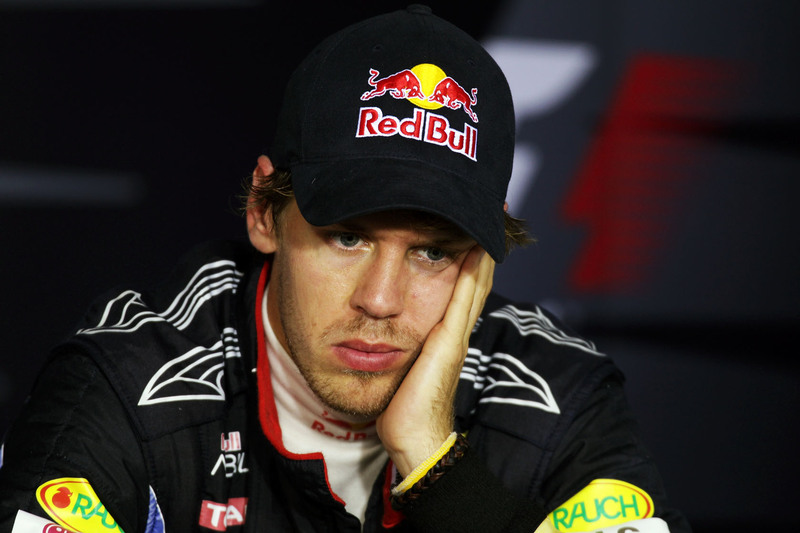 But Vettel…I am so disappointed in him. It was silly, really. Atleast he got on to the podium and the Championship is still well within his reach. But he needs to stop making these errors which might cost him dearly in the near future. Alonso, not a big fan of him but he drove well, really well. I thought Vettel would just roll past him but the Ferrari was equally fast, if not faster than the Red Bull on the straights, and he kept Luscious Liz at bay. Michael Schumacher, what can we say about that incident. It was dangerous and and it scared the living crap outta me when that happened. Like you said Soren, it could have been ‘a dead Rubens’. Good review, Soren. Keep them coming. Cheers 🙂 Vettels case is curious and one to study this year. Something I will do later and post during the break. The Rubens incident had the potential of much harm. So a penalty was in order for sure. Great read as always..The only thing i found unneccessary (sp?) was the mention of rubens being dead and how he died had they touched..Keep it up. In my defense, I did write “could have” as in what could potentially have happened. Not that he was a sure goner if they had touched. I guess I was still a little freaked out when I wrote it. another fine review. thanks! so i too think kobayashi is the most exciting new driver this year and would love to see him in a better team next year for sure that will happen. but here in the states there’s talk in the news that our kimster is considering the offer to race next to kubica. what do you know about this? is kimi ready to return or does he want another year in rally? From the looks of it and Kimis little hints here and there, he is set to stay in rally for 2011. 90% chance of that I would say. Another entertaining and non-biased review, Søren, -thanks. Vettel got a hard but regular punishment by the drive-through. I felt sorry for him, considering he has had quite some bad luck lately. He firstly lost his well earned lead of several of seconds, secondly the drive-through was hard for his “nap” (I tend to believe him on that one). But he has to stay focused, if he is planning to win the big one, -simple as that. Now there are a lot of contenders still in the run; Webber, Vettel, Alonso, Hamilton and Button all are capable of taking it home. Thanks, and keep up the brilliant work! Thanks again laffen. As always I appreciate your feedback. Yes, Alonso drove well and I guess I surpassed him a bit in my review. He has taken the place of Hamilton as the main antagonist in F1 for me. But it was not too intentional I left him out. Its just that it was always expected he would finish 2nd or 3rd in this race. As for Hamilton – yes 2008 was bad. I think he set a new record for most penalties that year. But he seems more mature and then I am able to appreciate his driving more I suppose.